Most people think about SMS as a marketing tool, but it actually has just as much utility as a customer service resource. If you aren’t currently using SMS for customer service, then you’re failing to take full advantage of this powerful mode of communication. Despite the widespread success of SMS and the fact that billions of text messages are sent each day around the world, the reality is that businesses are seriously lacking when it comes to adopting this powerful communication medium. Only seven percent of customers say they ever use SMS to communicate with businesses, which ranks eighth on a list of various communication methods. So, when you look at this data point, there’s one of two things happening. Either customers are consciously making the decision not to text businesses – even though the capabilities exist – or businesses are actively choosing not to invest in this communication channel. Surprisingly, the latter situation is to blame. While businesses may want to shift the focus and say that customers aren’t ready to text with companies, this simply isn’t true. Customers are comfortable with SMS – it’s time for businesses to become familiar too. Specifically, businesses need to start utilizing SMS as a customer service tool. There’s a ton of restrained potential here and companies like yours would be wise to look into the value an investment in text messaging could yield. 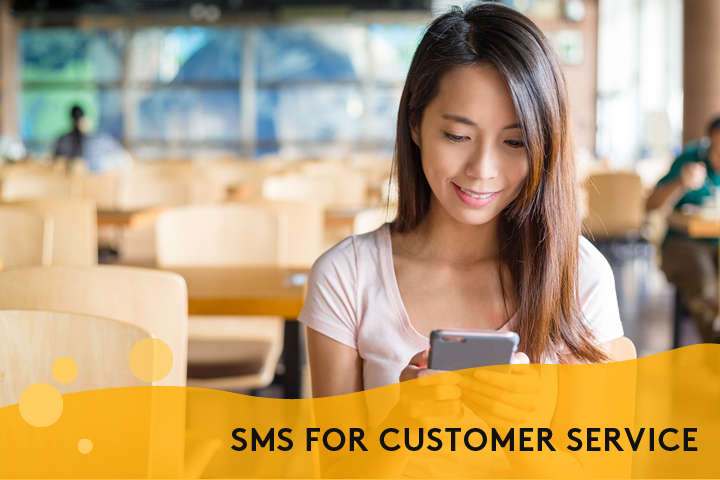 Whether you realize it or not, a large percentage of your customers would like the opportunity to contact you via SMS when it comes to customer service issues. “February 2016 research from independent analyst and consultancy firm Ovum found that many users in the US, as well as Germany, prefer to text for customer service,” eMarketer reports. “Nearly half (44%) of respondents said that one of the reasons they preferred to send a text to a company’s customer service department was because it was less time-consuming. Furthermore, 42% said they preferred to do so because it was more convenient than using the telephone.” Another 30 percent say SMS-based customer service is less frustrating. You can’t just ignore these numbers if you’re looking out for the best interests of your customers. The convenience factor is a huge draw and customers expect you to cater to them. Explaining to customers, after purchase, the best way to use the product. Providing step-by-step instructions by request. Offering automated replies to common inquiries. Scheduling service requests or convenient callbacks. Notifying customers when an issue has been resolved. Letting customers know when a product has been stocked or shipped. These are just a handful of possible uses – there are literally dozens more. While it doesn’t always make sense to pick up the phone and call a customer to tell them about something, you can always shoot out a quick SMS. It’s often the easiest solution. Outside of face-to-face conversations, there’s no mode of customer service communication that feels more personal than SMS. Automated phone services are cold and predictable. Email is often viewed as lazy or spammy. Mobile phones, on the other hand, are basically extensions of their users. When you send a text to a customer, they instantly feel like they’re being heard. This is especially true when you use SMS to circumvent long hold times in your call center. When someone calls and the wait is going to be longer than five minutes, you can give them the option to get a callback when the line frees up. Then, within 30 seconds, you can send a message that says something like, “Hey Dwight, I want to apologize for the wait. We’re finishing up service calls with a couple of customers right now and will get back to you in 10-15 minutes. Thanks for your patience, Jack.” That’s a lot more personal than playing some elevator music and an automated loop that says something along the lines of “we appreciate your patience” over and over again. Did you know that 98 percent of text messages are opened, while 90 percent are read within three minutes of being received? Other modes of communication don’t even come close to these rates. When time is of the essence, every second counts. And it’s the speed of SMS that makes it such a valuable customer service tool. Finally, you shouldn’t ignore the fact that once you exchange text messages with a customer for customer service issues, you’re opening the door for marketing opportunities. Once a customer opts in, you can then send them future promotional deals, news, and coupon codes. That’s a huge bonus and something that can further strengthen your customer relationships. Few communication channels come with such promise in today’s day and age. SMS is personal, quick, unobtrusive, and reliable. In other words, it’s a no-brainer. If you’ve put off adopting SMS in the past but are intrigued by the potential, then please don’t hesitate to contact us today. We’d love to discuss the many benefits of SMS in more detail and have personal discussions with your team regarding the ways it could revolutionize your approach to customer service. We look forward to hearing from you!